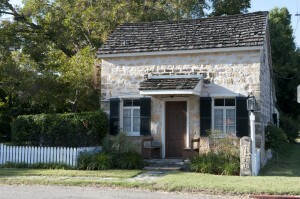 The Gillespie County Historical Society has unveiled seven properties that will be featured on the 2010 Holiday Home Tour on Saturday, December 11, 2010, from noon until 6 p.m. These select homes will be open to the public for the first time on the Home Tour, according to Jennifer Schandua, Home Committee Chair. Highlights range from historic properties that have been restored, to modern structures designed to capture Fredericksburg’s architectural heritage. Tickets for the Home Tour are $25 per person and include tour booklet and access to all properties. Tickets may be purchased online at www.pioneermuseum.net, by calling 830-997-2835, or at Gästehaus Schmidt Reservation Service, 231 W. Main Street. The Corn home that was built in 1995 and enlarged in 2009 is a fine example of Fredericksburg “built new to look old” architecture. Long leaf pine floors and trim compliment the limestone walls and create a cozy feeling that wraps itself around you as you enter the front door. After purchasing the home, the Corns initiated an addition to its footprint, creating a new large living and dining area with vaulted ceiling. The entire home looks into a courtyard area surrounded by a rock fence with grass and native plants. This beautiful home is filled with antiques, accent pieces, and – during Christmas – will include antique glass Christmas ball ornaments that have been collected over the years. A hobby /laundry room right off the kitchen holds a gorgeous display of plates and accessories in bookcases all along the far wall. A huge limestone fireplace stands freely in the area between the front entry and living room. Marsha has loads of silver accent pieces on her vanity and around the soaking tub in the master bathroom, with unusual shadow boxes scattered on every free space of wall in the master bath! A friend of hers makes cute and kind of wacky characters out of random scraps of paper, fabric, objects-just whatever and attaches them to the outside of her gifts. Marsha has kept all of these, framed them and put them on display! Purchased and restored by well-known local architect Albert Keidel in 1939, this home stands the test of time. The current owners have kept the footprint true to the original. It has small rooms, especially the kitchen, but makes good use of the space. It features tile and hardwood floors, fireplaces, and a bay window overlooking a fountain running through the garden. In the master bedroom there is an armoire facade built up to the wall to cover a standard size closet-very clever and attractive. The homeowners remodeled the master bathroom, featuring a skylight with a huge chandelier, a beautiful corner tub, exposed limestone walls, and an adorable vanity. The home is nicely decorated with eye-catching upholstery and a grand piano. Out of town, the newly built Lusk home and guesthouse provide stunning Hill Country views from hilltop settings. The guesthouse was built first for the owners to enjoy while construction on the main home was underway. Vibrant wall color as you enter the home helps to showcase the owners’ collection of Blue Ridge Pottery. A small screened in porch is sited to catch summer breezes, and a beautiful in-ground pool and surrounding landscaped patio beacons you to relax and enjoy the view. All areas of the property are pet friendly to accommodate the owners’ love for rescue animals. After retiring from busy careers out of state, the owners have happily settled in to the Fredericksburg community and lifestyle. The McCrae’s out-of-town home is one they built themselves in 1995. This original home was small and efficient, and built of reclaimed materials by the couple on weekend visits from their busy lives in San Antonio. After completing the house, they had a new barn built, and converted the old barn on the property into their guest quarters. An addition to their main house was completed in 2009. The home is filled with great antiques collected throughout their lives, and the views are spectacular. It is truly a property where their skills and their love of history are on display. This old Fredericksburg Sunday house was in the Weidenfeller family. In its later years it was a B&B, and is now the second home of this retired couple from Dallas. Judith has filled the home with treasured collections. The old rock home has clearly been well preserved. The living room features a fireplace, wood floors, baby grand piano, and antique furniture. The sitting area appears as though it may have been the back porch to the original house because the floor is rock. There is an old tub in the bathroom with a wood surround and a collection of samplers on the wall. An addition now houses the dining area and country kitchen, where Judith displays her collection of chickens from Schwettmann’s Taxidermy. Around the back corner of the kitchen is a staircase leading down to the wine cellar, probably the original home’s root cellar. Upstairs is a guest room that displays many children’s antiques. This small house packs a punch! This newer rock home has a cheery feeling as soon as you walk in, thanks to the lively yellow painted walls. Alice’s hobby is sewing and she has dressed the windows in her home, patio cushions, and much more. Her husband Pete’s hobby is woodworking. He has made many of the furniture pieces, including the nifty sewing table that folds out of the standard closet in the spare bedroom. The master bedroom showcases some more furniture built by Pete. Their living room has two sleighs on the wall that Pete made and a coffee table. There is a grape press behind one of the couches in the living room that came from Alice’s family. The roomy kitchen leads to a beautiful yard and porch where they have their morning coffee. The Jensens built a two-story building immediately behind the main house. The downstairs serves as a workshop for Pete and the upstairs is a B&B, A Star in the Hills. The Society is also hosting the Tannenbaum Ball on Saturday, December 4, at the Pioneer Pavilion in Lady Bird Park beginning at 7 p.m. The theme for the Tannenbaum Ball is the Diamond Anniversary, with elegant meal, first class entertainment, silent and live auction, and prize drawing. The prize drawing is for a .75-carat oval diamond valued at $2,200 donated by Segner’s Jewelers. Prize tickets are $5 each or 5 for $20 and can be purchased from Segner’s Jewelers at 236 W. Main St, Fredericksburg TX; Janie Trantham at 830-990-9675 or email at jt@ctesc.net; or Pam Spruiell at 830-997-5809 or email at pspruiell@aol.com. Tickets for the ball are $100 per person, or $125 for reserved seating. People can purchase reserved seats by calling 830-997-2835. These events are the largest fundraisers for the nonprofit Society that was formed in 1934 to preserve and share the area’s cultural heritage. Details and tickets may be purchased by contacting the Gillespie County Historical Society, 312 West San Antonio Street, Fredericksburg, Texas 78624, 830-997-2835, or by visiting the web site.